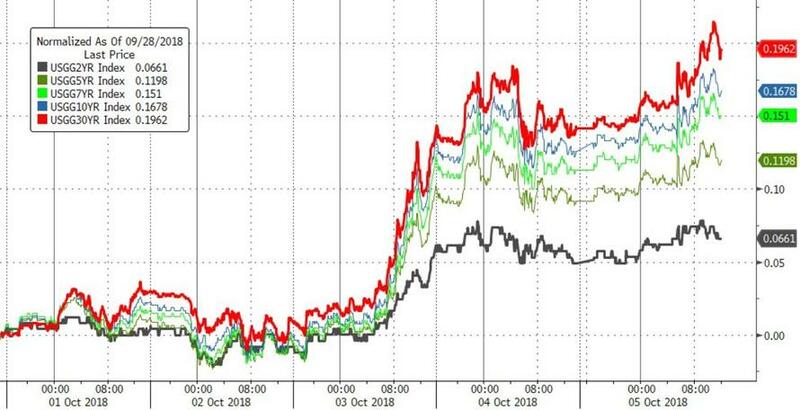 Markets were in turmoil, S&P futures were locked limit down as traders panicked, the establishment political system was in chaos and global bond portfolios were about to suffer a near record $1.2 trillion in losses in just a few days. 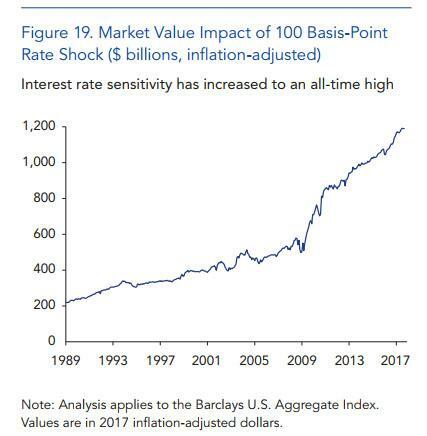 All this took place in the hours and days following Donald Trump's November 8, 2016 election as a Value at Risk (or VaR) shockwave spread around the globe over fears Trump would ignite an inflationary conflagration that would undo years of unorthodox monetary policy, sending interest rates soaring and crashing stock markets. 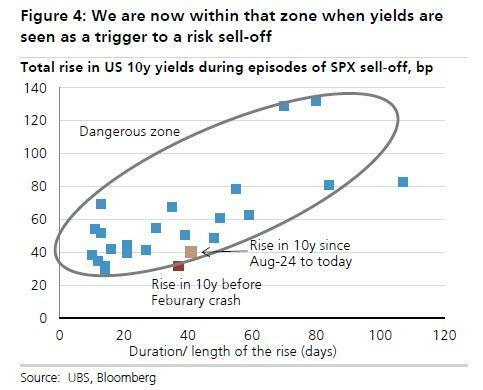 In retrospect it didn't happen, and as the initial shock from the political revolution in the US fizzled, bond buying resumed and the VaR shock of 2016 faded as an unpleasant memory. 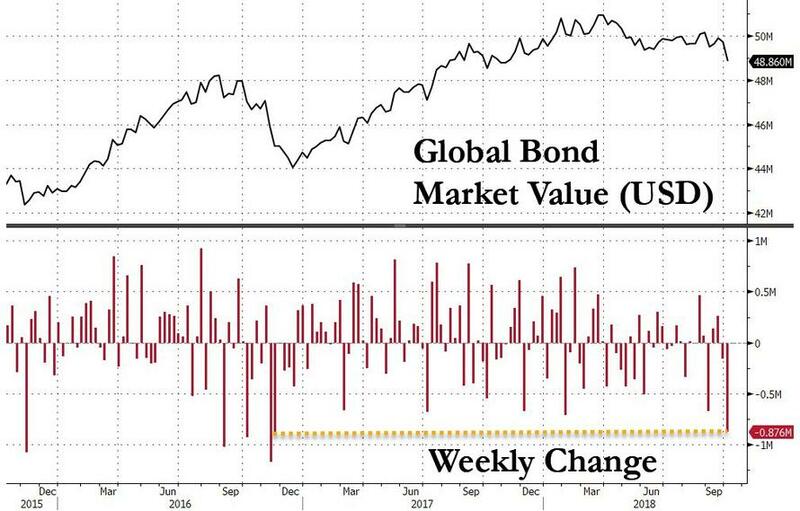 ... some $876 billion in bond market value was lost, the biggest weekly drop since the Trump election VaR shock, and wiping out one year's worth of mark to market profits as the aggregate value of global bonds tumbled to $48.9 trillion, the lowest going back to October 2017. The immediate catalysts have been extensively discussed here in recent days: a record non-manufacturing ISM, a surprisingly hawkish speech by Fed Chair Powell in which he warned that rates "may go past neutral" and, topping it off, another strong nonfarm payrolls report. Meanwhile, European bonds have tumbled on renewed fears about Italian politics while Emerging Markets have been routed as a result of the strong dollar which in turn has squashed local bonds. But besides the economic and political catalysts, a bigger threat is the soaring US budget deficit: with tax cuts by Trump’s administration putting the U.S. budget deficit on track to hit $1 trillion next year, Steven Mnuchin’s Treasury plans to borrow $770 billion in the second half of 2018, a more than 60% increase from the same period last year; and with the Fed actively reducing its own portfolio now at a $50 billion/month pace amid a sharp drop in pension fund and foreign investor buying, interest rates have nowhere else to go but up to attract buyers. The net impact is dramatic. 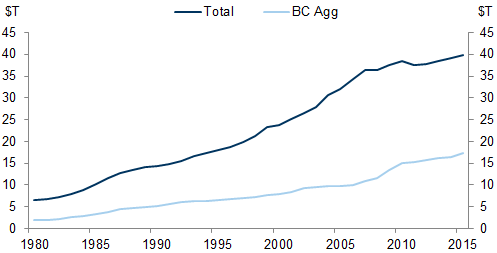 BlackRock estimates that the net supply of Treasury securities will more than double this year, to over $900 billion, and rise to nearly $1.2 trillion in 2019. The market hasn’t had to digest that much government debt since 2010 when the Fed was monetizing a substantial portion of this deficit with QE1 and QE2. Amid all this, it should hardly come as a surprise that the yield on 10-year debt has not only hit a seven-year high, but did so at a speed that equaled the January selloff, which triggered a 10% correction in the S&P. And while stocks just suffered their worst two-day drop since May, it could get much worse: perhaps the only thing preventing it is that while bond market volatility exploded from a record low this week, it still has a way to go to catch up to the dramatic move observed in January. That may still happen, because now that reality has once again crept back into the bond market with a bang, not a whimper, we are reminded of what Ray Dalio said back in January, when just before the January vol surge, Bridgewater's billionaire founder told Bloomberg TV that the bond market has "slipped into a bear phase" and warned that a rise in yields could spark the biggest crisis for fixed-income investors in almost 40 years. Dalio was referring to the record DV01 in the bond market, which according to the latest OFR report released in December, has risen to $1.2 trillion: that's the P&L loss from a 100bps rise in rates. The watchdog found that "valuations are also elevated" in bond markets. Of particular interest is the OFR's discussion on duration. Picking up where we left off in June 2016, and calculates that "at current duration levels, a 1 percentage point increase in interest rates would lead to a decline of almost $1.2 trillion in the securities underlying the index." However, as we explained last December, this is a low-ball estimate which "understates the potential losses" as it "does not include high-yield bonds, fixed-rate mortgages, and fixed-income derivatives", which would suggest that the real number is likely more than double the estimated when taking into account all duration products. As a reminder, Goldman calculated the entire duration universe at $40 trillion as of the summer of 2016, resulting in $2.4 trillion in losses for a 1% move. By now the number is far, far greater. 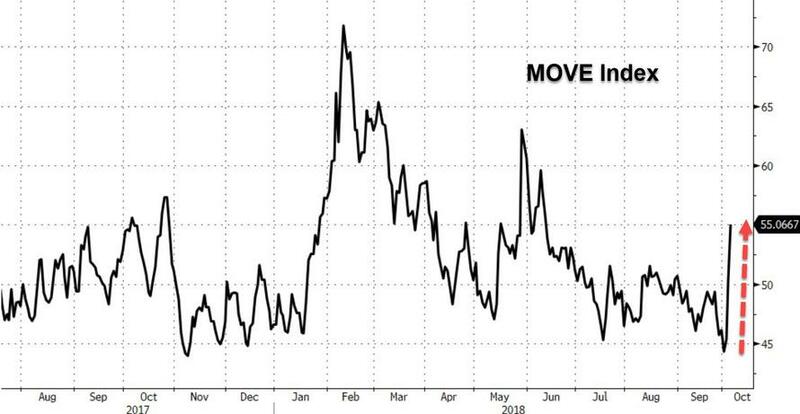 And sure enough, with US rates rising by roughly a quarter of a percent in the past week, the result has been over $800 billion in MTM losses, better known to bond traders as a "VaR shock." In another moment of foresight, during this year's Davos, Dalio also predicted that the Federal Reserve will tighten monetary policy more than they have signaled, and said that "economic growth is in the late stage of the cycle but could continue to improve for another two years." Again, it was Powell's explicit warning that the Fed will hike beyond the neutral rate that prompted stocks, which had until then largely ignored the selloff on bonds, to pay attention and to plunge. Why? Because as we showed earlier this week courtesy of the following chart from Stifel, every time this has happened, a bear market has inevitably followed. This is bad news for Trump: not only has Powell hinted that he will keep hiking rates for the foreseeable future, but in doing so the Fed will be the catalyst the ultimately crashes the market, something we discussed previously when we laid out the conditions under which the Fed would keep hiking, and warned that every Fed tightening cycle ends with a crisis. 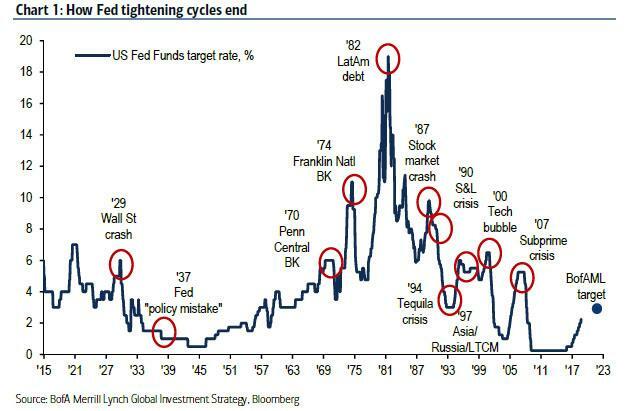 Every Fed tightening cycle creates a meaningful crisis somewhere, often external but usually with some domestic (US) fall out. Fed tightening can be likened to the monetary authorities shaking a tree with some overripe fruit. It is usually not totally obvious what will fall out, but that there is ‘fall out’ should be no surprise. Going back to the beginning, the problem with VaR shocks is that they are, by definition, unexpected and unlike traditional corrections when buyers eventually step in at "value" levels, a VaR shock is a positive feedback loop of liquidation, when as a result of the surging negative convexity from the rapid value loss of underwater positions, traders are forced to sell even more, accelerating the downward move. That may be why the 10Y bond rates closed near session highs on Friday even as dip buyers emerged in the last hour of trading in the S&P500. Their optimism may be premature: after all, as Bloomberg correctly wrote late on Friday, "All the Nightmares for Stock Investors Start in the Bond Market." And if the global bond rout accelerates next week when China returns form week-long holiday, the nightmare will have only just begun.